MoonMarble.com - Game Boulder Asst. 1"
Bulk Marbles → Opaque Game Marbles, all sizes → Approx. 1" or 25mm → Game Boulder Asst. 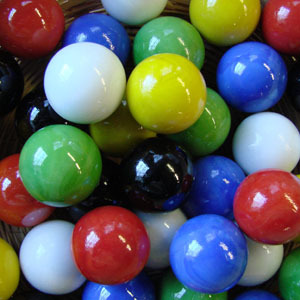 1"
The one inch diameter game marble may be purchased in assorted or individual colors. 12 packs, 100 packs, and 600 count cases are available. The six game colors are Black-White-Red-Green-Blue-Yellow. In the 12 pack, you will receive 2 of each color. In the 100 pack, you will receive 16 or 17 of each color. Lastly, in the 600 count case, you will receive 100 of each color. This size marble may sometimes have creases or cold rolled marks. They are usually not as smooth as the smaller size marbles. Sizes may vary slightly. Warning! : Choking Hazard. This toy is a marble. Not recommended for children under 5 years.